Like its co-creator Baz Luhrmann — The Get Down, the new categorization-defying epic hip-hop series from Netflix — is doing the most. Is it a television musical? Is it a drama? Is it a soap opera? Is it hip-hop? Is it disco? Is it a paean to teenage angst, or a hat tip to blaxploitation? Is it a tale of New York corruption or the Bronx rubble fields of the late 1970s? Well, it’s a Luhrmann production, so the answer to everything, of course, is yes. On Friday, Luhrmann’s extravagant first-time foray into television debuts on Netflix. Shameik Moore, one of the stars of The Get Down who plays the enviably named Shaolin Fantastic, described his boss in action during an interview at the summer Television Critics Association (TCA) press tour in Beverly Hills, California. Those yeses didn’t come cheap. The first season, which Netflix had originally budgeted at $90 million, or $7.5 million per episode, ended up ballooning to $120 million, according to Variety’s outline of The Get Down’s many production woes. For comparison’s sake, season six of Game of Thrones, one of the most expensive shows on television, costs an average of $10 million per episode. The Get Down went through two showrunners and myriad scripts before Netflix insisted that Luhrmann, whose role was supposed to be more of an advisory one, essentially shepherd the project himself. From left to right: Shyrley Rodriguez, Stefanée Martin and Herizen F. Guardiola in a scene from The Get Down. Luhrmann is best known as the silver-haired frenetic mass of ideas behind Warner Bros.’ 2013 adaptation of The Great Gatsby, as well as 2001’s Moulin Rouge and 1996’s Romeo + Juliet, and the not-so-well-received Australia. As an auteur, Luhrmann is not exactly known for restraint. Doing the most is his default setting. There are a couple of questions hanging over The Get Down. Will Netflix’s big bet on the show, which features a cast predominantly filled with newcomers and unknowns (aside from Jimmy Smits, Giancarlo Esposito and arguably, Jaden Smith) pay off? And how well does Luhrmann’s kitchen-sink-and-all approach to a story about the birth of hip-hop, set in the Bronx in 1977, actually work? The first question is difficult to answer, given Netflix’s well-documented and continued aversion to publicizing ratings. The most obvious vote of confidence we’ll likely ever see is if the show is renewed for a second season. But for supervising producer and music historian Nelson George, Netflix has already done something significant with its investment. Justice Smith and Herizen F. Guardiola in The Get Down. As to whether or not Luhrmann’s style actually works? It does. Mostly. The Get Down is nearly full to bursting with more elements than it’s able to contain. On the surface, it follows the story of a budding teenage lyricist named Ezekiel (Justice Smith), who’s in love with an aspiring singer named Mylena Cruz (Herizen F. Guardiola) and becomes friends with a mysterious figure, Shaolin Fantastic (Moore). Shaolin is a martial arts wunderkind/graffiti artist/aspiring DJ/all-around cool kid who seems at least partially inspired by Cornell “Black Benjy” Benjamin. Cadillac’s personal style was directly influenced by basketball great Walt Frazier. But everything is complicated. Ezekiel comes with a band of friends, the Fab Four Plus One, which includes Smith’s loopy, head-in-the-clouds character Marcus “Dizzee” Kipling. Mylena is desperate to escape the strictures of her church upbringing — her father Ramon Cruz (Esposito) is a despotic pastor who reigns over a converted opera house where he preaches every Sunday. He’s able to keep the doors open thanks to money from his brother, Francisco Cruz (Smits), a New York City councilman who is clearly on the take but has a small-time connection to the music business. And Shaolin is trying to figure out how to balance his dream of becoming a DJ like Grandmaster Flash with his obligations to Fat Annie (Lillias White), a lecherous Mama Morton type who happens to be the drug lord behind the disco club Les Inferno. Fat Annie uses the Savage Warlords gang as her persona army and her son, Cadillac (Yahya Abdul-Mateen II), serves as her coke-snorting, skirt-chasing lieutenant. Oh sure, the 93-minute pilot is a dizzying introductory mishmash of characters and storylines that leaves the viewer wondering where the hell is this going, but the show begins to find its footing in its second and third episodes, each an hourlong, and vulnerable, sweetly earnest turns from Smith, Moore and Guardiola leave you wanting more. 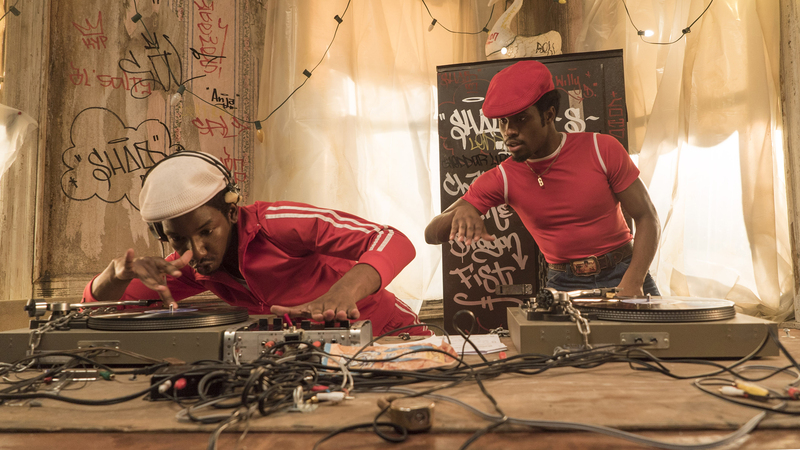 Mamoudou Athie (L) as Grandmaster Flash and Shameik Moore as Shaolin Fantastic in The Get Down. Each episode is introduced with a rap from an adult version of Ezekiel performing in concert in 1996. The raps are written by Nas, and it’s his voice we hear, but the body we see is actually that of Daveed Diggs, concealed beneath a hoodie and sunglasses. Diggs filmed the scenes while he was still working on Hamilton. While the story is largely driven by the enthusiasm over a then-nascent American art form, Luhrmann uses Les Inferno as an anachronism set in the middle of the Bronx, using cuts between an impromptu outdoor hip-hop jam and a night at the disco to illustrate how the latter influenced the creation of the former. On top of everything else, Luhrmann folds in archival news and documentary footage to fully ground the show in the context of 1977 New York (if some of it looks familiar, that’s because it’s from the documentary Rubble Kings). A generous portion of the third episode takes place during the New York City blackout of 1977. It’s a lot to absorb, and it doesn’t look like anything else on television, but it absolutely feels like a Luhrmann production, complete with lush costume design from Luhrmann’s wife and creative partner, the Oscar-winning Catherine Martin, which is perhaps why everyone connected to the show, from Luhrmann to Grandmaster Flash to Moore, kept publicly referring to it as a “film.” Cadillac’s personal style, George told me, was directly influenced by basketball great Walt Frazier. The disco scenes in particular are a delicious indulgence of Luhrmann’s tendency toward camp and excess. The performances are what sell The Get Down where it falters — namely, the challenge of keeping track of so many moving parts. This weakness is somewhat camouflaged by the fact that the show is meant to be binge-watched. If it were a network or cable drama airing once a week, you’d find yourself wanting a 45-second catch-up primer before each new episode. How well does Luhrmann’s kitchen-sink-and-all approach to a story about the birth of hip-hop, set in the Bronx in 1977, actually work? Perhaps the most beguiling aspect of The Get Down is the way it tumbles from sunny naiveté to uniquely teenage humiliation to the giddy nausea of first love that can so easily curdle into miserable, unshakable longing. Given how much of modern hip-hop has come to be defined and shaped by toxic masculinity, it’s refreshing to see characters who bring the heartache of Tony and Maria or Satine and Christian to the South Bronx. It is nakedly, unabashedly romantic. During the blackout, there’s an extraordinarily well-paced moment of tenderness between Francisco and an unlikely love interest, which stokes anticipation to find out where this relationship is going and how it began in the first place. 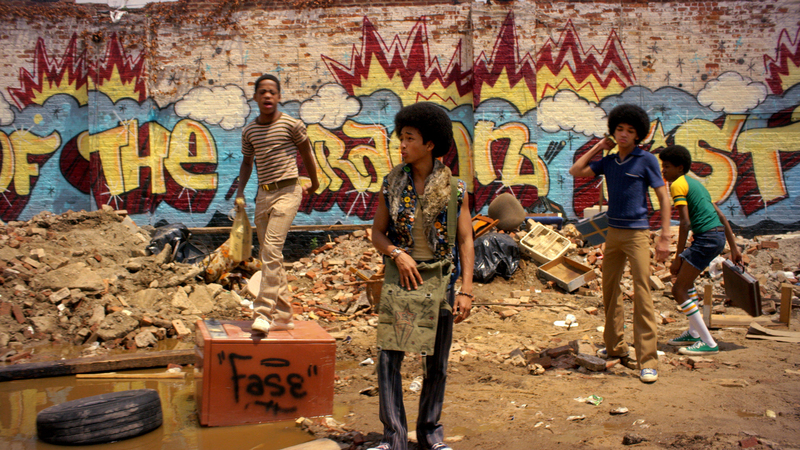 It’s the romance, in part, that allows The Get Down to sidestep the voyeurism of films such as Fort Apache, The Bronx or the possibility of falling into a series of irritating Dangerous Minds tropes. It’s carried by the youthful optimism of its characters. They live in the Bronx, and they’re aware of its flaws, but they’re not defined by the rubble or the crime that surrounds them. Luhrmann zeroes in on the universal elements of humanity while leaning heavily on the knowledge of producers Grandmaster Flash, George and Nas to stitch everything together. I’m sure there will be a zillion think pieces about how The Get Down isn’t Luhrmann’s story to tell. Judging from his unprompted remarks at the TCA, Luhrmann seems to be anticipating it, too. The Get Down is available to stream Aug. 12 on Netflix.